This year we will be camping at Ringstead, in a delightful farmer’s field, about 8 miles east of Weymouth. Our site is frequently used by groups such as ours, and is in easy reach by foot of the lovely Ringstead beach. From the camp site we have walked east to the beautiful Lulworth Cove via the spectacular Durdle Door. There’s even a ferry that goes from ‘our’ beach to & fro to Lulworth if you don’t fancy them-thar hills!. Camp is a marvellous opportunity for children and adults to live together as part of a community in natural surroundings. People of all ages and circumstances are welcomed, with or without partners or children. 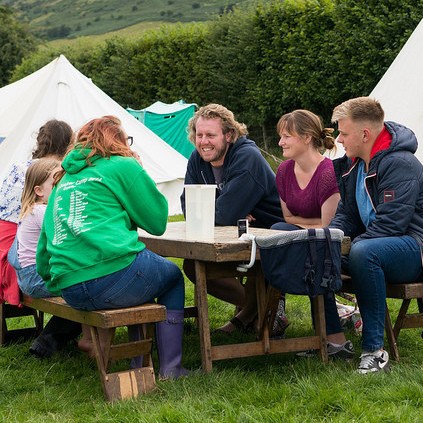 All share equally in camp life, including games, walks and camp fire, as well as essential jobs such as cooking, washing up, making cocoa or emptying the loos. In between these there is plenty of time to sit in the sun (or rain), talk or simply relax. Each camp has a different range of activities, depending on its location and the interests of the campers. Daily meetings for worship are held mid-morning and again around the evening campfire. Camp elders steer these meetings, and facilitate daily discussion groups. Camp is a community, powered only by the effort of those attending it. Support is required from all campers before, during and after the actual event so please assist wherever you can: helping out at camp repair day, camp committee meetings, loading and unloading the lorry and doing your fair share of jobs at camp. Campers are left to consider their own sense of responsibility on this. Camp equipment is shared with Gloucester Area Meeting (who will follow after us at Ringstead, 3rd to 10th August, this year). A marquee, gas stoves, elsan and eco-loos, tables, chairs, crockery and cutlery are provided. There are a small number of spare tents to borrow but if you have one, please bring your own. The cost includes all meals, campsite fees, plus communal camp equipment transport and hire for the week. We encourage people to attend for the full week. There is no reduction if people attend part of the week only. Bursary assistance with the cost is available. Each year, any who feel able donate some money on top of their camp payment to provide bursary help for those who are not able to afford the full fee. The bursary is shared between those who request help and, depending on the particular figures each year, can amount to up to about a half of their fees. Please ask for bursary help if you need it. Bursary requests will be handled in confidence. For anyone for whom this assistance is not enough, we can request further help from Area Meeting – please let us know if you require this. Booking forms are available online at www.bristolquakercamp.weebly.com/booking. The booking forms should be returned by Wednesday 15th May at latest, along with payment for either the full amount or the (non-refundable) deposit of £20 per person. Medical forms are now included in the booking form. Places will be allocated on a first come, first served basis. Please book only if you are sure you can come as, if camp is over subscribed, we don’t want to find that we have turned people away unnecessarily. Please do not bring extra, un-booked people to camp – contact Dylan to check if there is space. Your booking forms must be received by this date, but it is best to book earlier to avoid risk of disappointment. Join us for a sharing picnic lunch on the Downs, weather permitting. Directions will be sent out nearer the time and Redland meeting house or a suitable alternative will be booked as a back up. It is important for as many people as possible to come – it is a chance to meet everyone and to finalise arrangements. Bring food to share. As we are first this year, it is our responsibility to unloadthe lorry after Gloucester return from their Camp. There is a lot of equipment but many hands make light work, so everyone who can, please come along to help – we need lots of volunteers! Alternatively, our sister camp, Gloucester, will be at Ringstead from 3rd to 10th August– they are a smaller camp and welcome newcomers. Please contact Martin Quick: ‪01543 764553, mjquick@talktalk.net for more information.